I have a lovely bunch of natural makeup from Plain Jane Beauty here. This is my first encounter with this brand, and I’m very pleased to review its products. 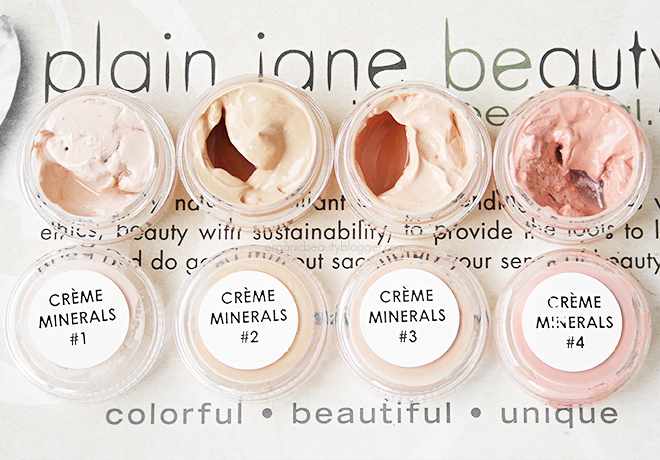 Plain Jane Beauty is all natural, non-GMO, and cruelty-free beauty brand from the US. Some of its products are vegan, but a few contain beeswax and carmine, so see the ingredient lists if you try to avoid these ingredients. I don’t know why, but I have this obsession with natural liquid foundations. Even before starting this blog, I used to hunt for samples or full sizes and try them out. Maybe it’s the fact that I couldn’t find the one that would be perfect for my skin. Most of them seemed too drying, too dark or simply did not give enough coverage. 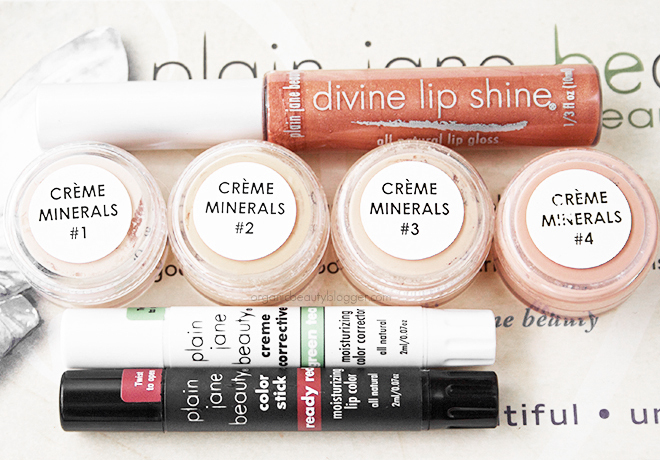 When Plain Jane Beauty Creme Mineral samples arrived, I was thrilled to try them. These babies are actually BB creams (the brand calls them so); however, they feel more like a liquid foundation to me. Formulated with 85% certified organic ingredients such as jojoba oil, aloe vera, calendula, and green tea extract and minerals such as zinc oxide and titanium dioxide. It declares in the title to be “suitable for all skin types”. I usually don’t even glance at products for all skin types and expect the worst of them, but this foundation surprised me. The application is easy, and I really like the fact that it gives sheer to medium buildable coverage without my skin getting dry or cakey. Another thing that I really like is that after few minutes it completely sinks in (and I mean completely – no stickiness), but still doesn’t feel drying. The finish is matte with a subtle glow. It stayed on my face for 8 hours no problem, but there were some dry patches on my cheeks at the end of the day. There are 16 shades (for different undertones: cool, neutral, and warm) in the range. I received 4 shades: #1 I Am Graceful (for very fair skin, cool undertones), #2 I Am Elegant (for light skin, warm undertones), #3 I Am Vibrant (for fair/light skin, neutral undertones) and #4 I Am Confident (for medium/dark skin, neutral undertones). The shades looked pretty dark and intense in the containers, but #2 and #3 were a good match for my light neutral skin. Aloe Barbadensis (Organic Aloe) Juice, Simmondsia Chinensis (Organic Jojoba) Oil, Aspalathus Linearis (Organic Rooibos) Extract, Titanium Dioxide, Calendula Officinalis (Organic Calendula) Extract, Emulsifying Wax, Tocopherol (Vitamin E), Iron Oxide, Camellia Sinensis (Organic Green Tea) Extract, Cetyl Alcohol, Isostearyl Isostearate, Potassium Cetyl Phosphate, Cetyl Behenate, Behenic Acid, Mica, Zinc Oxide, Stearic Acid, Limnanthes Alba (Meadowfoam) Oil, Daucus Carota Sativa (Carrot) Oil, Rosmarinus Officinalis (Rosemary Extract), Azadirachta Indica (Neem), And Frankincense, Cistus, Lavender, Cedarwood, And Chamomile Essential Oils. Vegan. I haven’t tried other correctors, but the Green Tea Color Correction Stick, made with various natural oils and beeswax, is creamy and, therefore, very easy to blend into the skin. 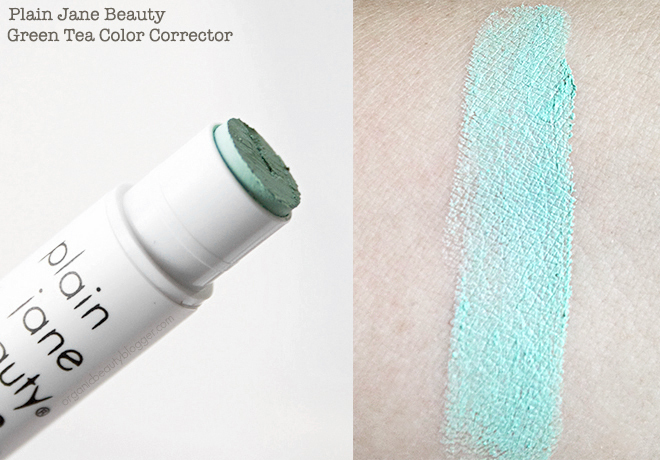 This corrector is definitely suitable for all skin types and gives medium to full coverage. I like that it comes in a slim, small tube, which is ideal for carrying around. The stick is a twist-up, but it seems a bit broken – it comes out of the tube fine, but to get it back, I have to push it in with my fingers. Prunus Dulcis (Sweet Almond) Oil, Titanium Dioxide, Apis Mellifera (Beeswax), Palm Christi Oil, Butyrospermum Parkii (Shea) Butter, Iron Oxide, Theobroma Cacao (Cocoa) Butter, Mica, Simmondsia Chinensis (Jojoba) Oil, Limnanthes Alba (Meadowfoam) Oil, Oenothers Biennis (Evening Primrose) Oil, Persea Americana (Avocado) Butter, Zinc Oxide, Tocopherol (Vitamin E), Rosa Mosqueta (Rosehip) Oil, Aloe Barbadensis (Aloe) Oil, Rosmarinus Officinalis (Rosemary) Oleoresin, Azadirachta Indica (Neem) Oil, Magnesium Stearate, Allantoin, Boron. Soothing, rejuvenating all-natural lipsticks made with evening primrose, avocado butter, and carrot oil. Not only this Lip Color is moisturizing, but it’s also highly pigmented, so I would definitely recommend using a lip pencil underneath it. The packaging is compact and lovely. However, the problem with the twist-up remains the same like with the Color Stick. There are 8 colors in the range. 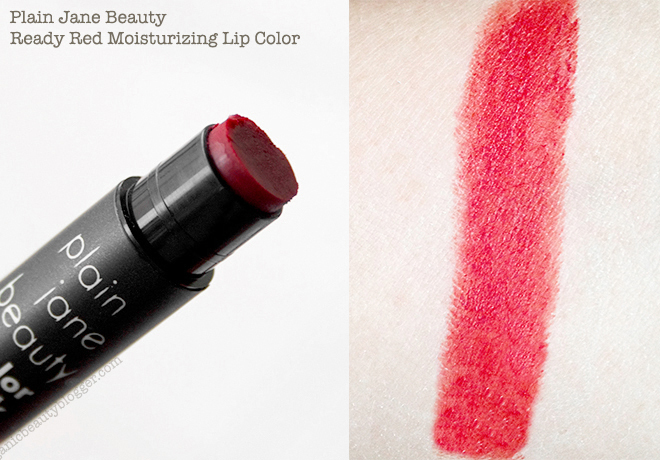 The Ready Red is a gorgeous vamp red. Prunus Dulcis (Sweet Almond) Oil, Apis Mellifera (Beeswax), Ricinus Communis (Castor) Oil, Butyrospermum Parkii (Shea) Butter, Iron Oxide, Mica, Theobroma Cacao (Cocoa) Butter, Simmondsia Chinensis (Jojoba) Oil, Limnanthes Alba (Meadowfoam) Oil, Oenothers Biennis (Evening Primrose) Oil, Persea Americana (Avocado) Butter, Tocopherol (Vitamin E), Rosa Mosqueta (Rosehip) Oil, Aloe Barbadensis (Aloe) Oil, Rosmarinus Officinalis (Rosemary) Oleoresin, Azadirachta Indica (Neem) Oil. Nourishing light copper lip gloss with tiny sparkles. The lips look juicy with this gloss, but unfortunately, this color does not suit me at all. The gloss is a bit sticky, but not too much. Its longevity is about average. Ricinus Communis (Castor) Oil, Prunus Armeniaca (Apricot) Kernel Oil, Limnanthes Alba (Meadowfoam) Seed Oil, Euphorbia Anisyphilitica (Candelilla) Wax, Butyrospermum Parkii (Shea) Oil, Brassica Campestris/Aleurites Fordi Oil Copolymer, Tocopherol (Vitamin E), Mica, Titanium Dioxide, Carmine, Iron Oxide, Daucus Carota (Carrot) Oil. Contains carmine. Have you tried Plain Jane Beauty? Hope you’ll have a chance to try it out! 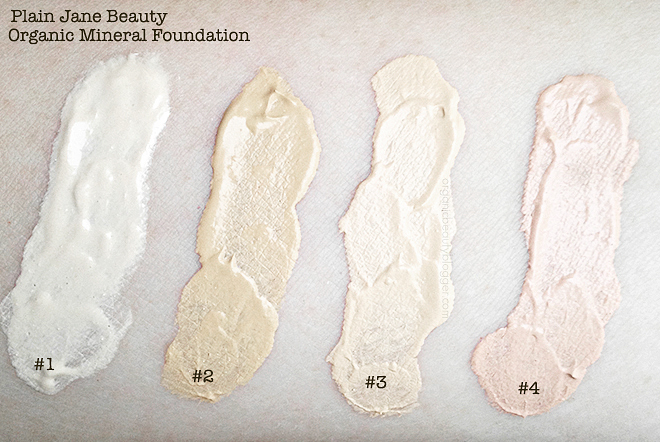 I also share your obsession with natural foundations. I’ll be trying the plain jane beauty mineral foundation for sure!